On Saturday, Lisa and I moved into our new studio. It's so nice! 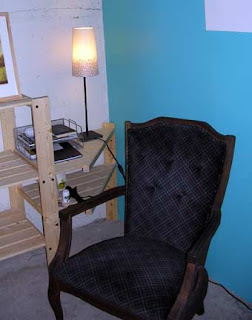 We painted two walls a beautiful teal color, and decked it out with lights and shelves from Ikea. Still need to build a couple of work tables, hang some pictures and take in some finished pieces from home, but otherwise its ready to go! It's so great to have my own space. Even though it doesn't have any windows, it feels really bright with the colored walls. I have about 4x the shelf space (that's my old space above), an area to sit and relax, room to put artwork on the walls (including this print I bought the other day at Crafty Wonderland). 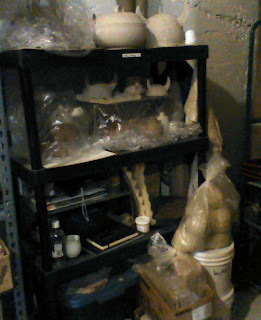 Of course I have yet to use the studio for anything other than putting together shelves and cleaning up paint...I spent all weekend there and did no clay work. But hopefully tomorrow I'll have time to do some pottery, and by the end of this weekend I'll be working at my new work tables. I'd like to invite everyone to our studio-warming party! It will be Friday, June 5, from 6pm-9pm (or later). This coincides with First Friday, so please explore all the great art galleries and artist spaces in the Central Eastside arts district, but be sure to stop by Radius (#14 on the map) and come downstairs to our new space! We will have some items for sale, but this is primarily a chance for us to show off our new space and visit with our friends. Hope to see you!